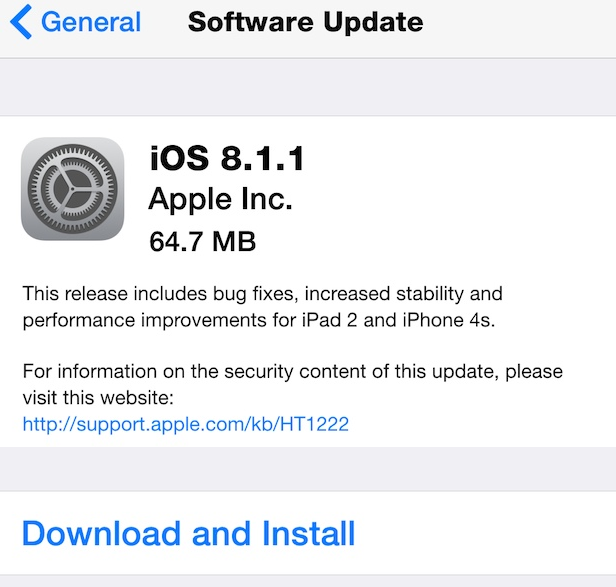 The official final version of iOS 8.1.1 Firmware for iPhone, iPad, iPod Touch and Apple TV has been released by Apple. iDevice users can upgrade / update / install the latest available iOS 8.1.1 Final Firmware (Build: 12B435 & 12B436) instantly. The Direct Download Links of iOS 8.1.1 Firmware Final IPSW for iPhone 6 Plus, iPhone 6, iPhone 5S, iPhone 5C, iPhone 5, iPhone 4S, iPod Touch 5G, iPad Air 2 6G, iPad Air 5G, iPad 4G, iPad Mini, iPad Mini 2, iPad Mini 3, iPad 3G, iPad 2G and Apple TV 3G are posted below. The official release notes of iOS 8.1.1 Final Firmware (Build: 12B435 & 12B436) Update holds; "enhancements in stability, improvement in performance and bug fixes for iPad 2 and iPhone 4S"
How to Install iOS 8.1.1 Manually? To receive (Over-the-Air) OTA Update of iOS 8.1.1 final firmware, just navigate to; Settings > General > Software Update option on your Apple iDevices. Apple iOS general public users (non-developers) and iOS developers can manually install iOS 8.1.1 via iTunes after, Download iOS 8.1.1 IPSW for iPad Air 2 6G, iPad Air 5G, iPad 4G, iPad Mini, iPad Mini 2, iPad Mini 3, iPad 3G, iPad 2G, iPhone 6 Plus, iPhone 6, iPhone 5S, iPhone 5C, iPhone 5, iPhone 4S, iPod Touch 5G and Apple TV 3G via Direct Links. Pangu8 Jailbreak Tool will soon be compatible with iOS 8.1.1 Jailbreaking.